This section of the AIMMS PRO documentation does not apply to the AIMMS Cloud Platform. See here for AIMMS Cloud Platform specific architecture. 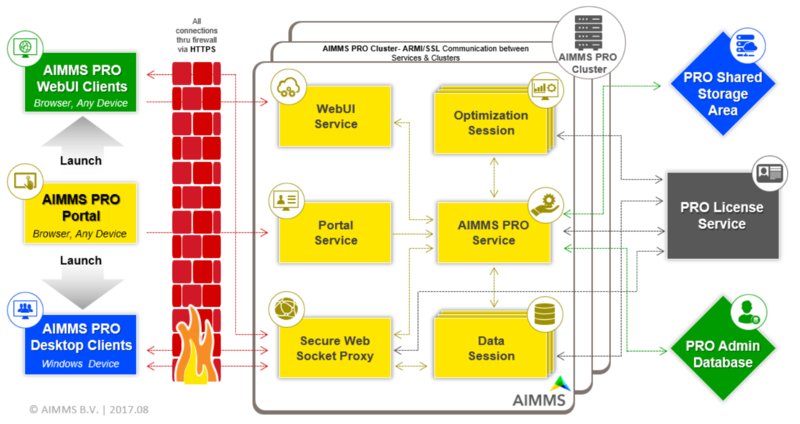 To provide you with a better understanding of what’s going on in an AIMMS PRO setup in terms of communication between the various components, we created the following schema. Please click on it to see a larger version. In the middle we have the enterprise firewall which is passed through, always, via HTTPS. As you know, HTTPS bases its encryption on SSL. On the right we have the PRO Cluster consisting of one or more PRO servers running Windows. Each server has three processes at the front: “WebUI Service”, “Portal Service”, and “Secure Websocket Proxy”. These three processes are serviced by a Jetty Application Server. The central service at the backend is the “PRO Service”. The PRO service invokes zero, one or more data sessions and zero, one or more optimization sessions. The communication between these four services, data sessions and optimization sessions is via ARMI/SSL. On the far right we have three resources shared by the servers: the PRO Storage, the PRO Administrative database, and the license service. The PRO Storage stores the AIMMS packages, the apps, and the cases and is only accessed via the PRO Service. Here SMB or CIFS is used to communicate. The PRO Admin Database is a PostgreSQL database storing information about users and apps, and is only accessed by the PRO Service via a secure database connection. The License Service is a service that connects to the other services via a binary proprietary protocol. Together, the WebUI service, Portal, PRO Service and Secure web-socket service realize the PRO environment. A data session is solver-less. The data session is actually run on the client computer when running the desktop client, and run on a PRO Server when running a WebUI app. An optimization session supports solving mathematical programs and is always run on a PRO server. The PRO Servers in the PRO cluster make use of three unique resources: * The PRO Storage: disk space where the AIMMS packages, the apps, and cases (binary compressed data snapshots) are stored. * The PRO Admin database, this is a PostgreSQL databases where administrative data concerning, users, apps, access rights and so forth are stored. * The License service, this is a tool that allows you to monitor AIMMS usage. Let’s aim for high availability and failover. The PRO Cluster itself is designed for high availability and failover. There is a master, which is self-elected, spreading the tasks over the available servers in the cluster. Every minute, via the PRO Admin Database, all available servers check whether the master and its peers are still running. The incomplete jobs that ran on a server that went down are queued again for a maximum of three times. You can improve the availability of the PRO Shared Storage Area by using a SAN, NAS or like storage device. There is no means yet to improve the availability of the License Service. You can improve the availability of the PRO Admin Database by replicating this database.